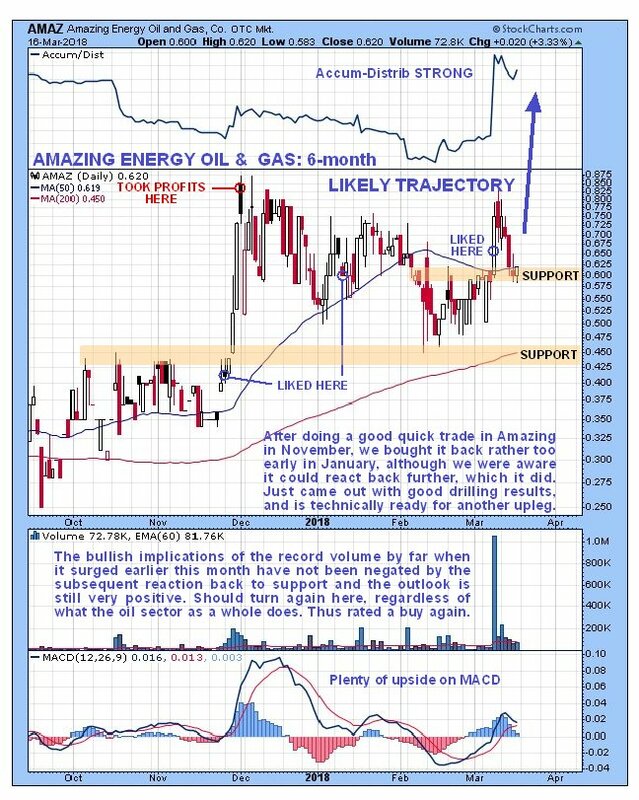 The purpose of this update on Amazing Energy Oil & Gas Co. (AMAZ:OTCQX) is to point out that its chart still presents a very strong picture, despite the reaction back of the past week or so, and since this reaction back is normal and has done no technical damage, it is viewed as throwing up an excellent buying opportunity in a stock that has demonstrated with its spike higher earlier this month on enormous record volume that it is set to go much higher. We can see the spike higher on massive volume and subsequent reaction back to support in detail on the latest 6-month chart and the point where we went for it again on 8th March as this spike was starting. The reaction back was due to overhanging supply from non-believers impacting, but on the next advance there will be less of them around. The volume pattern and volume indicators are strongly bullish, moving averages are in bullish alignment and the MACD indicator shows that there is plenty of room for a big move up from here. The 4-year chart is most useful as it reveals exactly what is going on and why Amazing has so much upside potential from here. 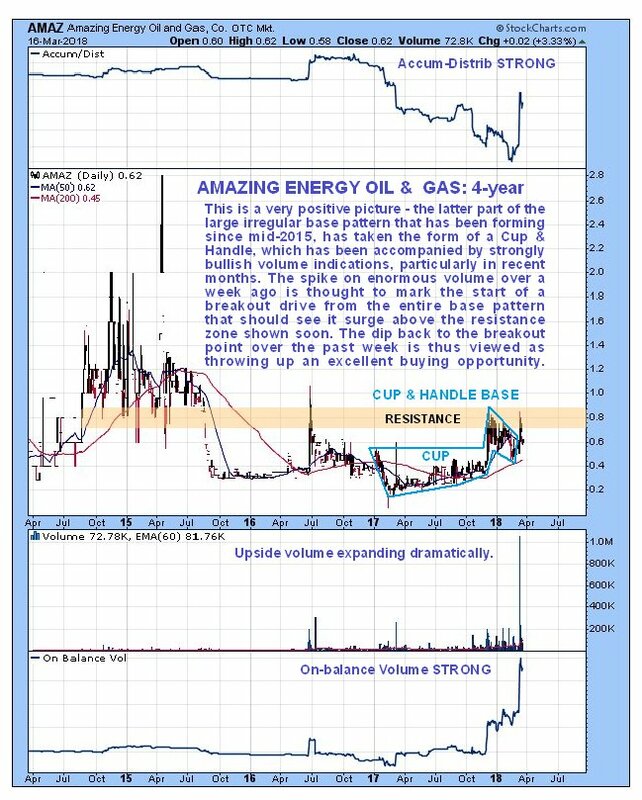 On this chart we can see that it has been marking out a giant base pattern since mid-2015, with the latter part of it, from early last year, being a slightly odd-shaped but distinct Cup & Handle base, accompanied by a signature volume pattern for this type of base pattern. The volume buildup over the past 6-months is a bullish sign, as is the resulting surge in volume indicators, especially in recent weeks. The reason for the massive volume blast over a week ago was that, despite it not breaking above the resistance marking the upper boundary of the entire base pattern going back to 2015, it was breaking out of the Cup & Handle base. Thus the reaction back that has followed over the past week is viewed as presenting the LAST CHANCE to buy this stock cheap before it takes off higher in a serious manner - and this should happen regardless of what the oil sector as a whole does, because of the fundamentals particular to this company. As you may recall we went for it again right ahead of the high volume spike, and as fortune would have it we are being granted "a second bite at the cherry." Conclusion: the prospects for this stock are very bright, and it is viewed as being at a great entry point here after the reaction of the past week or so, so holders should stay long and it is viewed as an immediate strong buy again here. Amazing has 68.4 million shares in issue, of which the float is about 45 million. Amazing Energy Oil & Gas website. Amazing Energy Oil & Gas Co, AMAZ on OTC, trading at $0.62 on 16th March 2018. Copyright © 2003-2017 CliveMaund. All Rights Reserved.